The cherry blossoms in Japan are mostly gone now, but I had a great time just taking a walk in the area I live in. I live in a relatively rural area near the city, so I'm not too far away from civilization, but the I live in a town in a district rather than in a city or a ward. There are flowers across all of the branches above, but I like to look for flowers on the trunk of the tree. 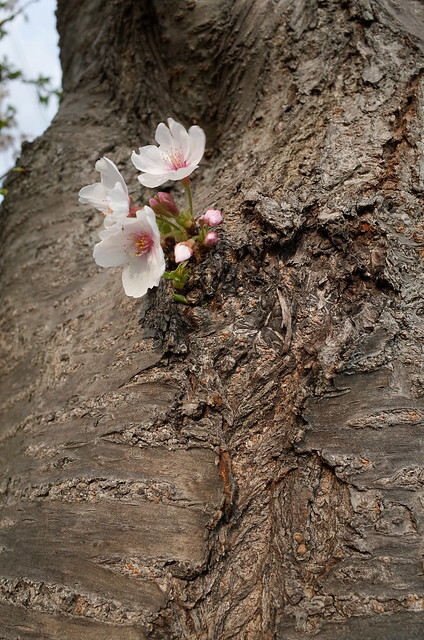 Some still budding, some almost losing their petals, the strength and beauty of Sakura are exemplified for me in the flowers I find on the base of the tree. With the end of cherry blossoms comes the various flowers and plants that make this season great. There were trees with cherry blossoms along the river, in parks, and even on large hills and small mountains where I live. There were local communal events like yard sales which out family enjoyed. I'm fortunate enough to be able to enjoy beautiful cherry blossoms where I live. I'd rather stay close to home than travel out to a crowded area, especially with my kids. Taking my kids outside, this was a great time to take out the Ricoh GR, my favourite camera for walkabouts. Sure, it's a fixed focal length. Sure, 76degrees field of view (28mm equivalent) may seem a little wide. But I can carry it with me while I walk around with my two kids (five and two), and everything else I have to carry around with them. 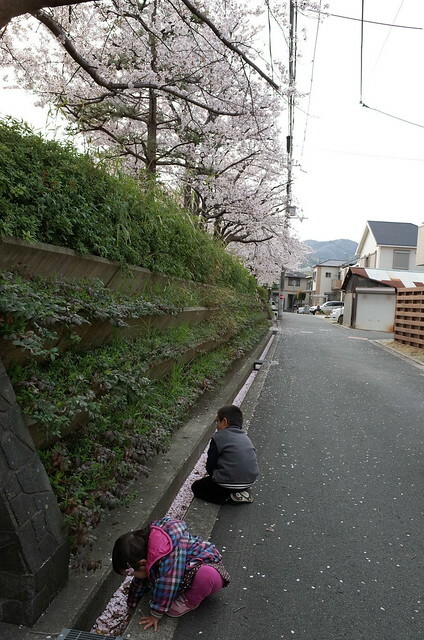 My son shows me cherry blossom he found, it looks pretty intact. My daughter is in the background trying to weave a cherry blossom in her hair. On windy days, the cherry blossoms begin to fall, and my children squealed "cherry blossom snowstorm!" 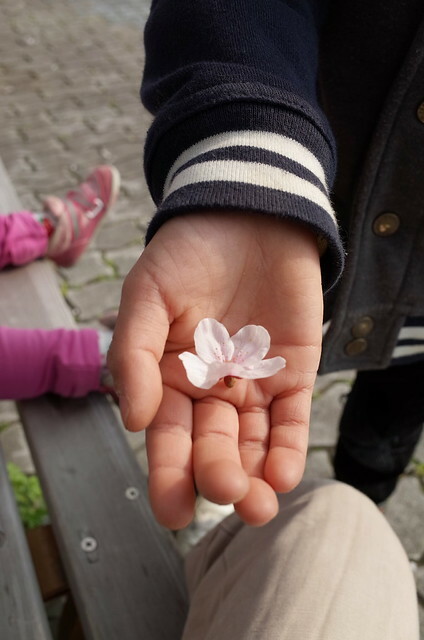 Of course, they started recreating their own version of a cherry blossom snowstorm by grabbing handfuls of petals they could find anywhere, and throwing them in the air. Looked like they were having a great time.